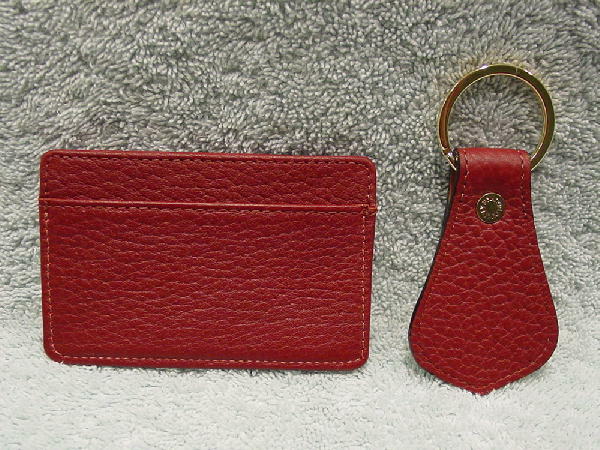 This never-used business card/credit card holder and key holder are by Dooney & Bourke. They are in a burgundy leather with accents in a saddle tan. 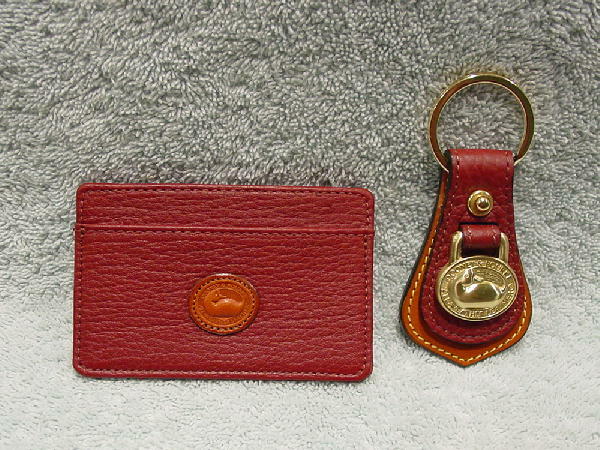 Circling the gold-tone metal duck (on the key holder) and the tan leather duck (on the card holder) it says Dooney & Bourke All Weather Leather. The inner diameter of the gold-tone metal key ring is 1 1/8". On the back of the gold-tone metal snap it says Dooney & Bourke. The card holder has an open center full pocket and the front and the back also have open pockets. The pockets are lined in a shiny golden brown fabric. They're from a stylist's inventory, and were used in a product photo shoot. top of metal ring to bottom of leather 4 1/8"
leather at widest 1 3/4"